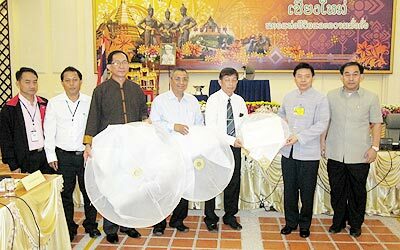 The organising committee, led by deputy Chiang Mai governor Chuchart Keelapaeng, (2nd right), held a press conference to introduce a new style of safety Yipeng lanterns to be used for the upcoming Loi Krathong festival . The Electricity Generating Authority of Thailand, the Provincial Electricity Authority and Tudong Satan Lanna in Mae Rim from where 3,000 – 5,000 Yipeng lanterns are released each year, have cooperated in designing ‘Tamchai’ lanterns, which will be used in the upcoming Yipeng Lantern Festival as well as in the following years’ events. A new slogan for this year’s celebration, ‘Release Yipeng lanterns to preserve Lanna Customs’, has also been created by the Tourism Authority of Thailand , (TAT), and the city’s municipality. Traditionally, the releasing of Yipeng lanterns was associated with eliminating bad luck and bringing in good fortune, with the lanterns in great demand countrywide. According to TAT, the lanterns are now mostly associated with the Loi Kratong festival and the bringing of many tourists to Chiang Mai. As a result, in recent years an increase in the number of lanterns has caused fires, disruption to electrical supplies and interference with air traffic..
During previous festivals, the number of Yipeng lanterns that fell onto high voltage substations has increased from 91 in 2006 to 147 in 2008, causing 53 power outages in a number of provinces and damage estimated at 4.5 million baht. Flights from Chiang Mai International Airport were also affected. For these reasons, the modified Tamchai balloons were designed. The new lanterns will come in 3 sizes; the largest being 140 cm. in length and 90 cm in; diameter; the medium size is 100 cm in length and 70 cm in diameter and the smallest is 70 cm in length and 45 cm in diameter. The wire is 30 cm long, and will stay attached to the lantern. The wick burns more quickly and will go out before the lantern falls. The light weight of the new design passes the standard of the Department of Civil Aviation. The new design was tested November 8 last year, with no fires or power outages noted. Chumporn Saengmanee, Deputy Governor of Chiang Mai, Boonlert Buranupakorn, President of Chiang Mai Provincial Administrative Organisation and Chadcharn Eakchaipatanakul, the managing director of Wanasanan Shop, chaired a press conference to introduce the vegetarian festival which will take place between October 18 and 26. A press conference was held October 7 at the Green Lake Resort Hotel to announce a vegetarian festival in honour of HM King Bhumibol Adulyadej, chaired by Chiang Mai deputy governor Chumporn Saengmanee, President of the Chiang Mai Provincial Administrative Organisation Boonlert Buranupakorn, Wanasanan Shop MD Chadcharn Eakchaipatanakul, and TAT Chiang Mai’s director Chalermsak Suranant. The event will take place between October 18 and 26 at Buddhasathan on Thapae Road, and will be Chiang Mai’s largest annual vegetarian festival. Activities will include a merit-making and worship-oriented parade on 26th, beginning at the train station and progressing through Wararos Market to Buddhasathan. The main highlight of the festival will be a huge pan of fried Chow Mein. The Chiang Mai Provincial Administrative Organisation is promoting the annual vegetarian event as a highlight of tourism in the city and invites all residents to make merit by practicing vegetarianism in dedication to His Majesty King Bhumibol Adulyadej’s good health. European cinema is coming to a screen near you! For the 18th time the European Union Film Festival brings the best of European films to Thailand, offering audiences a world class selection of drama, comedy, romance, suspense and documentary. 24 films from 18 European countries are featured in the programme. The EU Film Festival will run in Chiang Mai from November 5 to 15 at the Vista, Kad Suan Kaew and in Bangkok on 19 to 29 at SF World Cinema. The festival will open with Zozo, an extraordinary story of the journey of a young Lebanese immigrant to Sweden, based on the real life experiences of the film’s director. Dr. Sigrid Faltin, film director from Germany will attend the screenings of her film “La Paloma Longing Worldwide” in Chiang Mai on the 15th and also attend at the opening in Bangkok on the 19th. The films from Germany, Netherlands and Poland all have Thai subtitles; otherwise the films are subtitled in English. The Life Change People are qualified and experienced counsellors, therapists and life coaches based in Chiang Mai. Their unique Life Change Programme, based on recent advances in motivational psychology, has been offered for the past year as part of a luxurious life-enhancing holiday. Many people have visited the city, staying in one of four locally owned hotels, and have successfully undertaken a Life Change Programme while enjoying all that Chiang Mai has to offer. The company is now proud to announce an exclusive service offered to residents of Chiang Mai - our unique and highly regarded Life Change Programme conducted as a series of individual life coaching and counselling sessions, to fit into your lifestyle. Starting with full clinical personality profiling and analysis, this programme has been developed to allow you to make and maintain major life changes, and as such is ideal for expats, recent or long-established. relationship problems, including cross cultural relationships? Are you eating or drinking too much to enable you to cope? Are you unhappy, bored, stuck and unsure what to do next? Our Life Change Programme has proved effective for all this and more. We also offer counselling sessions for either individuals or couples who don’t want to undertake a Life Change Programme but do want some help. Contact us for special discounted prices for Chiang Mai residents. Counselling services are also available online, check our website for details and contact us for Chiang Mai prices. As well as all this, the Life Change People can now offer to business owners their comprehensive Personality Profile and Analysis Report, to help you succeed in filling your most important vacancies. Ask your short-listed applicants for key posts to complete our questionnaire You will receive a detailed report, noting elements of their personality which may help or hinder your business. Introductory Offer to all employers and business owners: Free personal Personality Profile and report….try it for yourself before using it for your business.